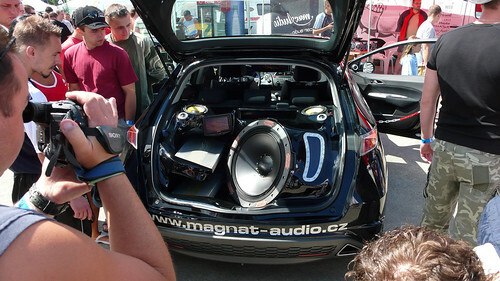 Do you hate subwoofers like I hate subwoofers? Does the low-fi din of an earth-shaking, bumper-rattling car stereo, detectable from a quarter-mile away and meant to broadcast the owner’s flagrant and rebellious love of bass-heavy hip-hop, make you want to just shut the thing off? If so, I think Make magazine can help us out. You see, a couple of months ago Make, the do-it-yourself magazine for techno-geeks and home tinkerers, featured plans for the TV-B-Gone hoodie. The TV-B-Gone is a small device that will shut off any TV within range, and the hoodie is meant to conceal this sometimes controversial act by executing it with a mere shift of the zipper. Now, in its most recent issue, Make features a different DIY creation, the solar car subwoofer, in which the author shares his plans for mounting solar panels on his car to drive his booming speakers. “What’s a road trip without awesome tuneage?” writes the enthusiastic but misguided lad, who’s employing green technology to practice dark arts. You see where I’m going with this, right? The Subwoofer-B-Gone hoodie. For its next issue, I challenge Make to create a device that will allow me to silence subwoofers—solar powered or not—with my “modded” hoodie. I’m not interested in hearing why it won’t work: I’m leaving it to these genius tinkerers to find a way. Then, the next time some inconsiderate punk is disrupting my day by getting crunk, or hyphy, or grimy, or whatever the hell that horrible sound is, I won’t have to stand for it. The only problem, perhaps, is that I’d have to wear a hoodie. And do you want to hear how I hate hoodies? Image by Josef Rousek, licensed under Creative Commons. Friggin' Genius! Maybe whole cities could set them up on top of office buildings to cancel sub-woofage throughout. I'd really like a device that would just instantly drain their car batteries and kill their alternator. You neglect to mention portable cell phone jammers. Sound cancellation technology is the thing to use, like in the Bose headphones. Just broadcast the way 180 degrees out of phase and you're ear won't hear a thing.